The U.S. Energy Information announced on their Website today that Ohio's Utica Region will now be included in EIA's monthly Drilling Production Report. The August 11th report points to the Utica Shale as one of the fastest growing and the recognition has certainly been deserved. Many of us looking at EIA's reports for Utica Shale details the last year or two have been somewhat dismayed to see the shale relegated to the "other" category, no longer. The Utica Shale is stepping up to play with the "big boys". The latest report from the EIA here shows the Utica region listed with the rest (Bakken, Eagle Ford, Haynesville, Marcellus, Niobrara, and Permian). The new recognition is due to the enormous increase in natural gas attained by the Utica Shale as of late, up from 155 million cubic feet per day in January 2012 to an estimated 1.3 billion cubic feet per day in September 2014. Source: EIA.gov. 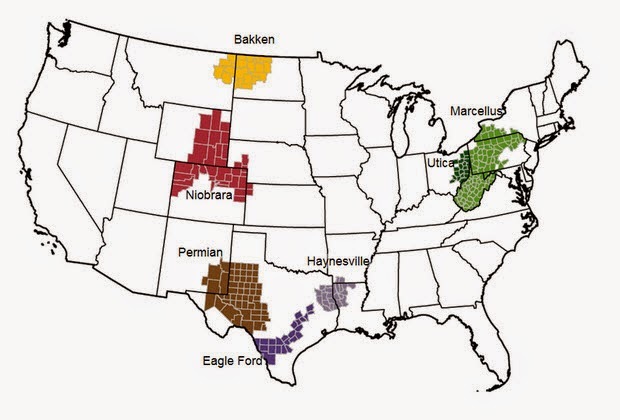 The seven most prolific shale plays in the Lower 48 states.